Engineers have added a cold air vent to certain Chevrolets for 2016 to help keep smart phones wirelessly charging in the car from overheating. DETROIT -- Chevrolet is beating the heat this summer by rolling out a phone-cooling system in select 2016 models. 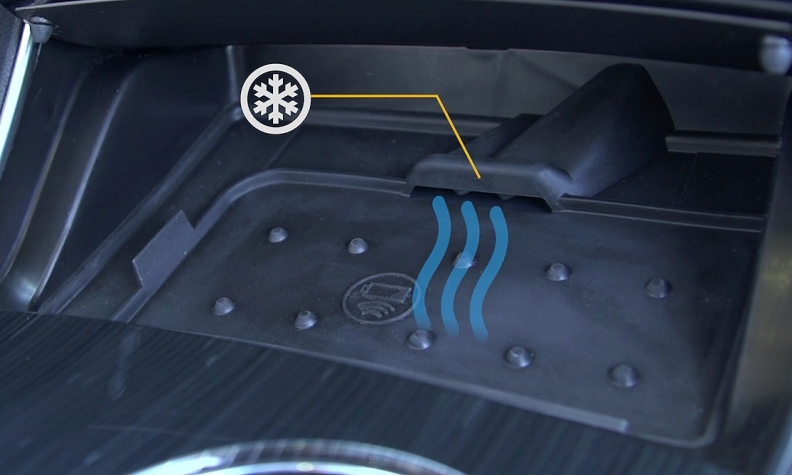 The new feature, which Chevrolet has dubbed Active Phone Cooling, uses an air vent connected to the vehicle's air conditioning and ventilation system to cool the wireless phone charging bin in the center console. It is a standard feature of the optional wireless charging dock. "Innovation doesn't mean reinventing the wheel," Impala engineer Dan Lascu said in a statement. "Sometimes simplicity offers the most elegant solution to a problem." Most smartphones avoid overheating by shutting off or pausing charging, which could render Chevrolet's wireless charging bin useless when cabin temperatures are higher than normal. Chevrolet engineers developed the phone-cooling system after noticing temperature-related issues during wireless charging testing. Some smartphones would suspend charging or turn off after a few minutes in high temperatures inside the car's cabin. The feature will first appear in the wireless charging-equipped 2016 Impala this summer. It will also be available in 2016 Malibus, Volts and Cruzes.